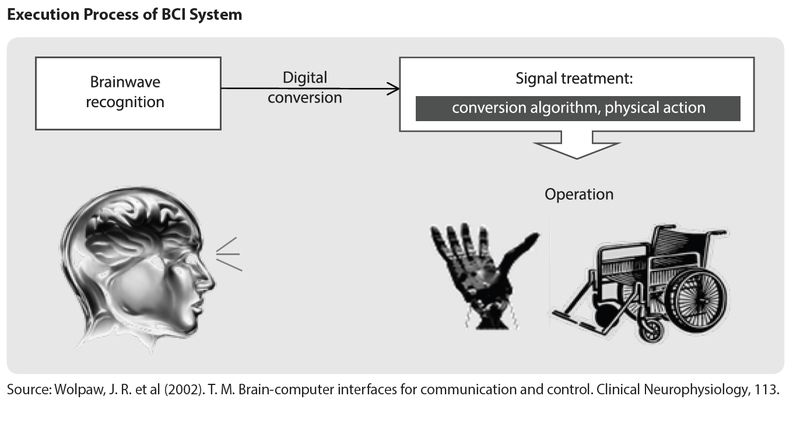 Korea's Information Society: The brain to computer interface: the future of user interfaces? The brain to computer interface: the future of user interfaces? Digital communications technology is developing at a breathtaking pace, and one area in which we're likely to see big changes is in the user interface with computers. Most of us are still accustomed to keyboards, but smartphones and tablets have already begun to change that with touch screens, voice recognition and smart stylus input. However, as reported by the Samsung Economic Research Institute, advances in brain to computer interface (BCI) technology may soon change all of that. BCI is gaining momentum as a next-generation technology for everyday needs. As shown in the accompanying diagram, in a BCI system, a brainwave is read and converted into a digital signal that is processed and converted into some sort of physical action or application. The variety of actions/applications that might be developed in the future seems to be limited only by one's imagination.